Heat oven to 350°F. Make brownies as directed on box for 9-inch pan, except stir 1/2 cup chocolate chips into batter before spreading in pan. Cool 15 minutes on cooling rack. Spread hot fudge over brownies. Place in freezer 30 minutes. Spread yogurt evenly on top. Sprinkle with 2 tablespoons chocolate chips. Place in freezer about 4 hours or until firm. Just before serving, cut into 9 pieces. Store any remaining dessert tightly covered in freezer up to 1 week. Try substituting Yoplait® Fruitful™ strawberry yogurt in place of the Yoplait® Fruitful™ cherries & red berries yogurt. 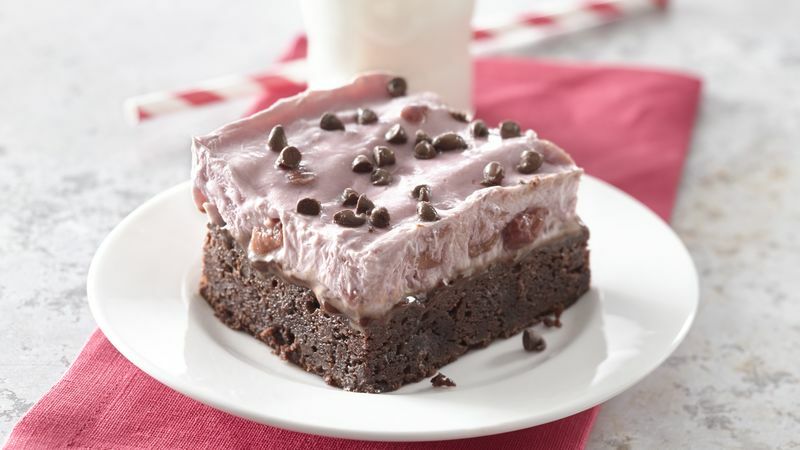 If the dessert is frozen solid, remove from freezer 20 to 30 minutes before serving to soften slightly. Yoplait and Fruitful are trademarks of YOPLAIT MARQUES (France) used under license. ©2013 Yoplait USA, Inc.